The Bruce Devlin designed course incorporates rolling landscapes with the dramatic Fife coastline. 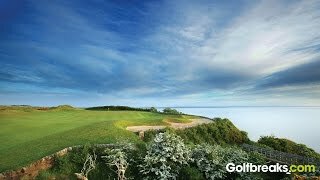 Opened in 2002 the newly designed course is one of two courses onsite at the five star Fairmont St Andrews. The venue boasts a number of awards including the 'European Golf Resort of the Year' and voted 18th in 'The World’s Top Golf Resorts', showcasing high class facilities alongside outstanding golf. Out of the two courses Kittocks Course is known as one of the more challenging course, where a great deal of accuracy comes into play. Stretching across 7,230 yards, you will also need a great deal of length to master the challenges the courses presents throughout. Surrounded by stunning coastal backdrops Kittocks course, St Andrews is a beautifully challenging layout with much to offer for all abilities of golfers and a great addition to a unique golf vacation in the land of ‘The Home of Golf’. 18 holes, par 72, 7191 yards. Links.